The Miramar Santa Monica will pursue aggressive sustainability goals in line with the City’s sustainability priorities on water usage, energy and LEED ratings. 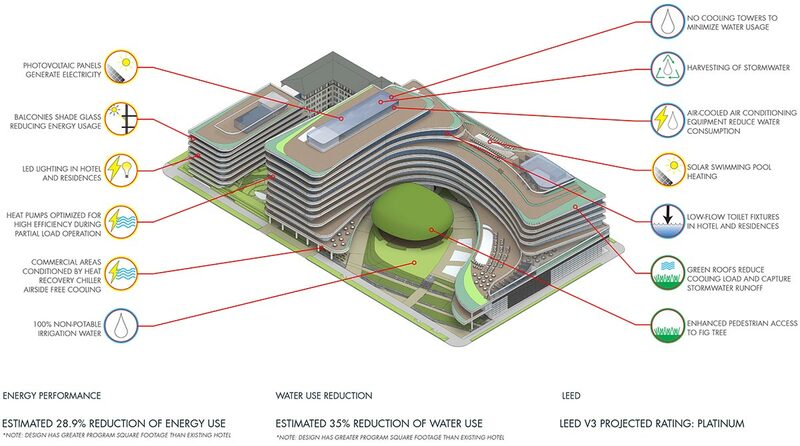 It will replace existing infrastructure with modern, efficient systems designed to significantly reduce water usage (preliminary estimates at over 33% savings when compared to the existing hotel) and utilize less energy than the existing hotel (preliminary estimates at 29% savings). By incorporating “green building” design features and recycling systems into all new construction and operations, the Miramar Santa Monica hopes to achieve a LEED-certified Platinum designation. The landscape design uses a low-water and drought-tolerant plant palette. The project will use a highly efficient, subsurface drip irrigation system and a weather-based irrigation controller that will achieve significant water use reduction (compared to a conventional irrigation system). No potable water will be used for landscaping. Recycled water from the building will be collected, filtered and re-used as the main source for irrigation. The proposed energy systems, which may evolve during the detailed design process, have been selected to achieve the maximum cost-effective level of energy efficiency. The current design sites photovoltaic panels in various roof and canopy locations as appropriate. Solar pool heating, possibly through combination photovoltaic/solar thermal collector will also be installed.